As quickly as the AW18 shows came around, the closing day has arrived. Sticking to tradition, the final day of PFW has some of the season’s biggest shows – namely Chanel, and Louis Vuitton, with Miu Miu sandwiched in-between the two. Opening the latest show was not a model, but instead, actress Elle Fanning. Fanning is a Miu Miu fave, previously starring in both the SS14 and SS17 campaigns for the label. Coming up the stairs in the Palais d’Iéna – longstanding venue for the show – she was wearing an oversized brown coat over a denim shirtdress and burgundy knit. The look was accessorised with a neckerchief and boots, as well as a giant beehive. Like the hair styling, the collection reminded us of John Waters’ 1974 film Female Trouble, starring drag legend Divine and Cookie Mueller – who was one of the inspirations behind Raf Simons’ AW18 menswear collection. Elsewhere, the collection referenced the idea of retro, 60s bad girls with models like Slick Woods, Adwoa Aboah, and Lily McMenamy wearing winged eye makeup. 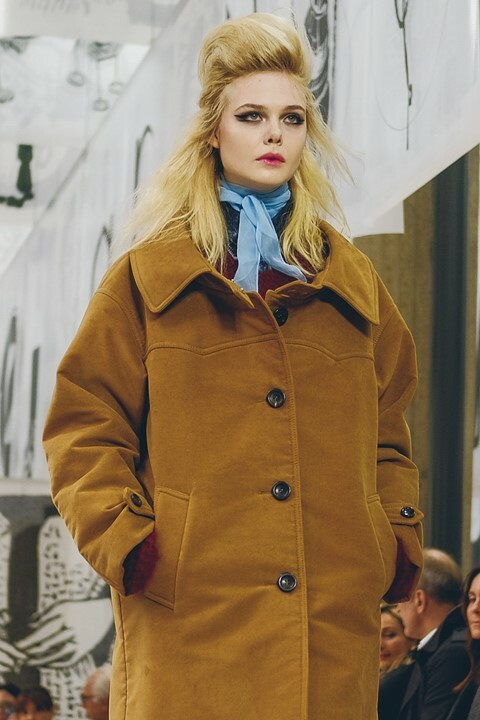 Weaving through the set – that had flags emblazoned with letters of the alphabet and sketchings of inspirational women – Fanning appeared at the end of the show in her second look, another oversized coat, this time with leather and tweed panels. Now, with two out of three of the final shows finished, only Louis Vuitton remains for this season.